Pro ballers are so effortlessly athletic that it’s easy to forget that their on-court brilliance is the hard-earned result of a lifetime of give-it-all-you-got work. Even then, when we do consider the grind, it’s generally framed in physical terms, like the number of hours spent in the gym, pick-up sessions played over the weekend, or make-believe championship games hypothesized on the driveway (where you always hit the buzzer-beater, of course). In doing so, the mental and the emotional side gets overlooked—those moments of self-doubt, second-guessing, and dream questioning that precede collegiate hype, draft day, and lucrative pro contracts. The highlight reel of success is always rolling for the general public, but the misfires and setbacks are left on the cutting room floor. And that’s not limited to just sports, either. Professions of all stripes require cultivating a mental resilience and adaptability to complement natural talent, savvy, and smarts. 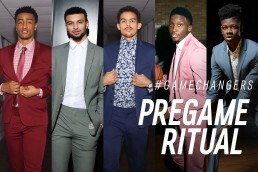 So although you might not be able to do a windmill jam (or touch rim), these life lessons from hardcourt stars and Express Game Changers Victor Oladipo, John Collins, Jamal Murray, Trae Young, and Mo Bamba are an easy layup to success in any life endeavor (seriously, though—we can’t touch rim either).